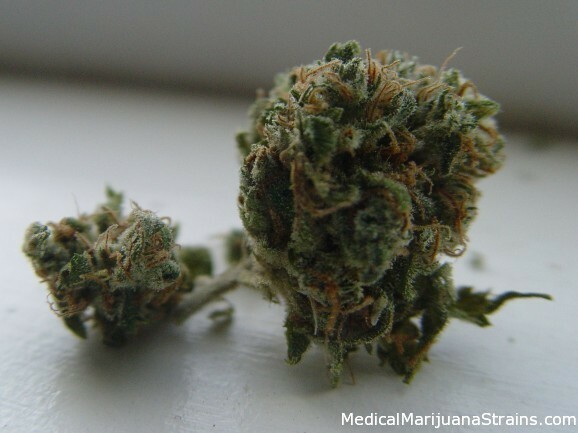 Type: Hybrid, with a definite sativa lean. Looks: This bud is light and airy, with gorgeous dark orange pistols peeking out between dark green leaves whose edges are white with THC growth. The bud itself seems a bit older, its pretty dry and crispy at this point. You don’t get hit with that sharp, dank bud scent until you grind it up. Smell: Smells sweet, almost like candy, with a slightly cheesy undertone. At the beginning of a deep clean inhale, your nose picks up a slight mint undertone as well. Taste: As far as taste goes, it comes off as a very smooth vapor, tasting almost equally of the sweetness in the scent, and the dankness after you grind it. When vaporized it smells much, much stronger than when in bud form. Effects: As far as thought processes go, this buzz is pretty clearheaded. Also, it works very well on stomach cramps, and definitely increases appetite. Bodily, it is a pretty dense warm feeling. Reaction times are definitely slowed. Eye movements lag a bit, and vision gets a bit blurred, but no red eye, that I’ve experienced so far. Potency: Decrease in intensity began around hour 3 and lasted until hour 5.5 or so. I’d give this one a 7 out of 10 for potency. Good Strain For: Works well medically, but I don’t think I like how loopy my eyes feel, it makes it hard to function entirely normally, even after an hour or two.